As you know, I like to vary my holiday baking from year to year. Each year there are the “they’d kill me if I didn’t make these.” These are your rum butter nuts, schweddy balls (chocolate peanut butter bon bons) and sugar cookies. Then there are the newbies–always at least one or two. The newbies aspire to be tried and true. Sometimes they advance, like the World Peace addition from a couple of years ago. Sometimes they see a single season and then are never heard from again–like last year’s white chocolate and pink peppercorn sables. Finally, there are the rotators. These guys come in an out every few years depending on the whim of the baker and which way the wind happens to be blowing. Or something like that. Baklava, toffee and jam thumbprints among others fall into this category. Always a personal favorite of mine, jam thumbprints were asked back to the dance this year after a three or four year absence. They’re festive looking and a nice fruity and nutty balance to the chocolate goodies. They can also be a pain to make. In recalling where this recipe came from, I realized that jam thumbprints might just be my introduction to Ina Garten. I was home from college for the holidays and while polishing the silver or making name cards (tasks which I’ve only recently realized were designed to keep me out of trouble), my mom turned on a show hosted by a lady with nicely manicured hands and a ridiculous house in the Hamptons. 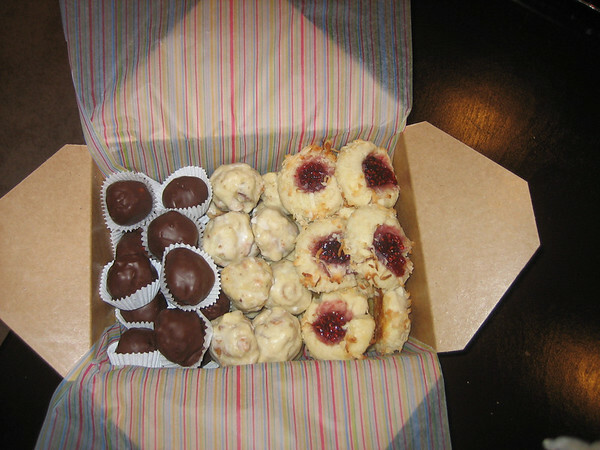 In the episode she made a batch of jam thumbprints, wrapped them up in little glassine bags tied with ribbons then hopped in her Mercedes, hand delivering to friends along the way. The whole thing seemed so contrived. And yet. I wanted to wrap up cookies in cute bags, jump in my German luxury vehicle and drive among the mid-winter dunes delivering cookies like a WASPy socialite santa. But back to the fact that jam thumbprints are tedious. The original recipe asks the baker to make the dough, chill it, shape individual balls, roll them in egg wash, roll them in coconut, make thumb indentations, fill with jam and then, finally, bake. Not awful, but I found that since these are a fairly crumbly shortbread cookie, the rolling and printing after the dough was cold could be problematic. Often, the dough would crack…and a cracked vessel will not hold its treasure. And, the egg wash was messy. So I played with the process a bit in the name of mass production and came up with a technique that streamlines the rolling and dipping and such. In this little twist, the dough is made and then immediately shaped, rolled in coconut (no need for egg wash), indented and then chilled. Then, when it’s time to bake all that needs to be done is to fill with jam and into the oven. No cracks and because the dough is still cold when it goes in, they keep their shape a little better. Did I take pictures of this? Of course not. Why would I do that? It isn’t like all of this was going to go in a visually driven blog. You’re just going to have to take my word for it. In an electric mixer fitted with the paddle attachment, cream together the butter and sugar until they are just combined and then add the vanilla. Separately, sift together the flour and salt. With the mixer on low speed, add the flour mixture to the creamed butter and sugar. Mix until the dough starts to come together. Once balls are rolled, roll each in coconut. Then, go back through and press a light indentation into the top of each with you finger. Arrange closely on a cookie sheet, wrap loosely and chill for at least 30 minutes. Place the balls on an ungreased cookie sheet with at least 1 inch in between. Drop 1/4 teaspoon of jam into each indentation. Bake for 20 to 25 minutes, until the coconut is a golden brown.